Though there are a few color drawings on paper here, these are mostly graphite drawings from Mike's voluminous sketchbooks. Each pencil rendering is scanned in the computer for tonal adjustments (for a more complete breakdown of Mike's process go to "Behind the Scenes" GIRL LAB Drawing section) . The retouched image is printed by Mike himself on Arches Museum Rag, the world's finest art stock. Pencil lines remain evident. The effect is that these prints look amazingly like original pencils, only huge. Note: Please DO NOT assume you've experienced these images just because you've seen them on your computer screen. These are merely very low resolution representations. In full resolution, removed of © markings, and printed nearly 2 x3 feet, these drawings are FAR more impressive than indicated here. 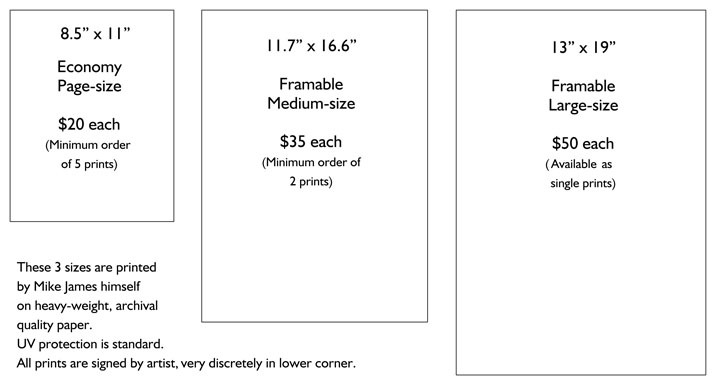 Several different sizes of prints are available. All are shown at the BOTTOM of this page. Click on Any Thumbnail for a larger view. There are multiple Thumbnail pages. Use "Back to Drawing Thumbnails" blue type at bottom of the big pictures to come back to that image's thumbnail page. Happy trails. Click here for more information on Mike's drawings. All drawings are also available in LIFE-SIZE on canvas or silk!